OUR BEST FRIEND CAN BE A LIFESAVER! Let’s support Diabetes Assistance Dogs training. Until the Forum starts, we will finance the training up to twelve diabetes service dogs for young people with Type 1 Diabetes diagnosis. These trained dogs will be handed over by us to 12 young owners at the Closing Ceremony on Sunday, October 6th. You can find about making donations on this website. 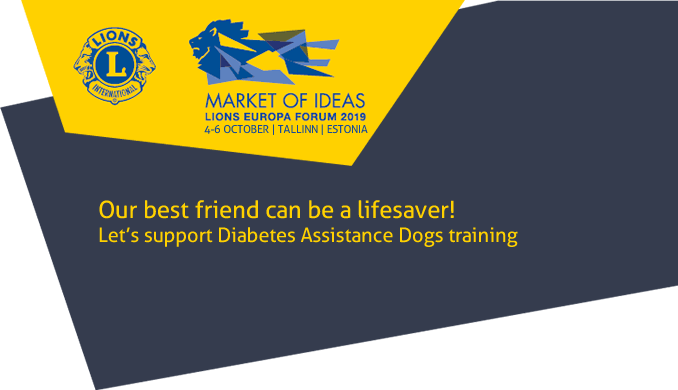 PID Kalle Elster: Dear Lions, please help us train diabetes service dogs for young people to keep their sight by making a small donation. Training with twelve dogs have started already. Who are the diabetes assistance dogs? The diabetes assistance dogs are trained to assist an individual with diabetes by alerting when there is an imminent pronounced drop or increase in blood sugar level and/or demonstrating specific behaviour during or immediately after a hypo/hyperglycaemia episode. The mission for training the dogs is to empower people with Type 1 Diabetes to improve their quality of life by providing assistance to families training their diabetes alert dog.